The Laquan McDonald shooting has brought the police union under fire. Is there a culture of cover-up among cops? Last week, Fraternal Order of Police President Dean Angelo told “Chicago Tonight” he met with Vanita Gupta, Assistant Attorney General for the civil rights division, who is heading up the Department of Justice investigation into the Chicago Police Department; and Zachary Fardon, U.S. Attorney General for the Northern District of Illinois. The meeting with Gupta and Fardon came on the heels of Mayor Emanuel’s speech on Wednesday to City Council that addressed a “code of silence” that he says exists throughout the department. Angelo joins “Chicago Tonight” to talk about the perceived culture of cover-up among cops. Below, some highlights from our discussion. Paris Schutz: I want to ask you about how the rank-and-file has reacted to all calls of reforms in recent weeks. Dean Angelo: Well, I think the rank-and-file is extremely upset with what’s going on, the rhetoric, the blasting of their career choice. There are so many exemplary police officers out there each and every day. Right now, they’re out there. And they think they’re taking a very unfair view—or the politicians and the media are all taking an unfair view on what they do every day. PS: Did the mayor draw battle lines with the police with that speech [before City Council]? DA: Well, he certainly didn’t make any friends. To say that that’s what officers do when they go out to work, I think is unfair. I don’t think the mayor gets it. I don’t think today in the year 2015 there’s an officer on this department that knowingly engages in covering up for a fellow officer. PS: Not one officer in the entire department of 12,000? DA: I’m not going to say not one officer. I’m not going to be that extreme. I’m not going to say that there is a culture, as he put it, of covering up. It’s not 1950. There are cameras out there. There are video cameras everywhere. To think that an officer with four or five kids is going to jeopardize their career and their family’s livelihood to take a measure of covering up for someone that did something obviously wrong in front of them, I just don’t see it. PS: And yet Jason Van Dyke had numerous complaints against him, on video he shoots Laquan McDonald 16 times, [and] McDonald appeared not to be a threat to him. Why was Jason Van Dyke on the job for a year after that? DA: Jason Van Dyke had a handful of complaints over the course of his 15 years. People say maybe up to 18. He was working in some of the most violent neighborhoods in one of the most violent cities in the country. So when you’re taking that many people to jail, no one wants to go to jail, no one’s going to say thank you for arresting me. And there are gang members and people who know how to play the system and jam up police officers. Allegations come part and parcel with aggressive police work, and if you look at the amount of years he’s served and the amount of complaints, he’s got less than two complaints a year. PS: What about the other cops on the scene that made statements that McDonald was attacking Van Dyke? Why are they still on the job? DA: That’s going to come out in investigation. What we try to do with our contract—our administration has been extremely proactive—we tried to get language in the contract so officers could view a video prior to make a statement so that they could be consistent and they could accurate. And we were denied. PS: So the city did not let these officers view that video before they made their statements? DA: No, and we asked for that in contract negotiations. 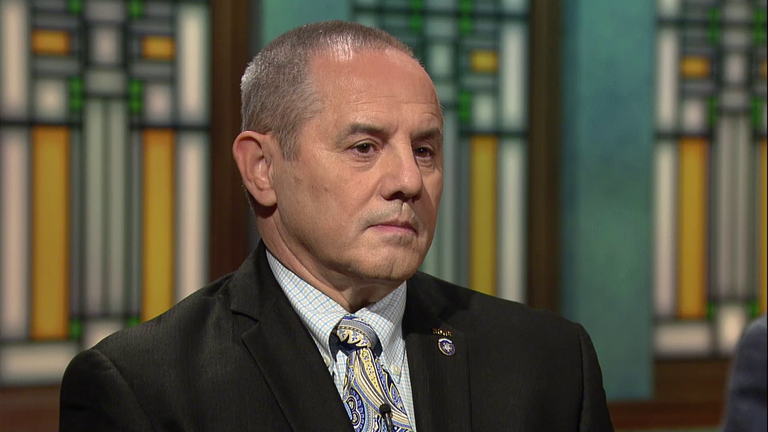 Dean Angelo, the head of the Chicago Fraternal Order of Police, met with Department of Justice officials in Washington, D.C. this week as the agency begins its civil rights investigation into the Chicago Police Department. With his approval rating at an all-time low and protesters chanting outside the City Council chambers, Mayor Rahm Emanuel delivered a rare special address to apologize for the fatal police shooting of Laquan McDonald. The U.S. Department of Justice launches a federal investigation into the police department and Mayor Rahm Emanuel announces a major shakeup at the agency that investigates police misconduct.